Dario Robleto, Will The Sun Remember At All, 2012. Suite of 9 archival digital prints on Epson Somerset Velvet 255gsm paper. Inman Gallery is pleased to present new work by four gallery artists at Art Brussels 2012. Dario Robleto (American, b. 1972) concentrates a variety of everyday and esoteric materials into intricate, relic-like objects and images. Following his passion for DJ culture, Robleto’s alchemical approach involves “sampling” and then “remixing” vestiges from popular music, history, and science—melting a vinyl record by Billie Holiday, for example, into replacement clothing buttons. Accompanying “liner notes,” usually in the form of a wall label, poetically detail the sources embedded in each work. 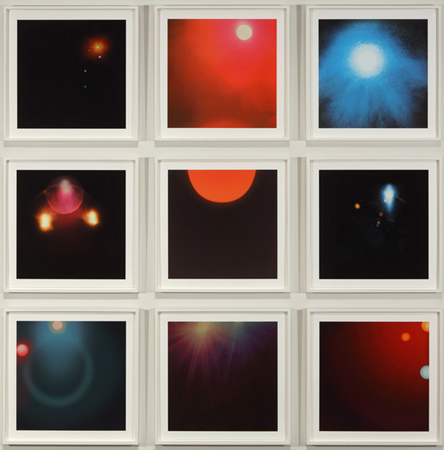 Will The Sun Remember At All (2011–2012) is a new suite of nine prints that couples two of Robleto’s early loves: record album design and NASA photography. The nine prints depict digitally manipulated live-concert album covers by now-deceased musicians, including John Coltrane, Jimmy Hendrix, and Frank Sinatra. Robleto digitally excised the text and performers—the “stars”—from the covers, focusing attention instead on the background stage lights, which resemble celestial formations. Blending romance and science, the images are at once portraits of absence and comforting reminders that music never dies, that a sound wave of a Hendrix riff is always traveling through deep space, available to be heard and loved for the first time. Demetrius Oliver (American, b. 1975) creates minimal, mysterious works that convey the artist’s personal investigation of the universe, in turn inviting viewers to contemplate their own relationship to the wondrous unknown. In photographs, sculptures, and drawings, Oliver transforms everyday objects to evoke astronomical and photographic phenomena, often depicting his body and studio space as uncharted phenomena to be explored by the dynamics of reflected, cast, or captured light. The three works on view expound Oliver’s transcendental approach to materials. Albedo (2010) presents a piece of luggage unzipped to reveal surreal contents: incandescent light bulbs and chunks of anthracite coal that might power them. In an image from the photographic series Ember (2007) Oliver echoes the moon’s reflective visibility. The artist depicts his hand clenching a fistful of lightbulbs, creating a globular mass onto which he has projected photographs of workspaces. Finally for Ether (2011) the artist arranged and spray painted umbrella parts on paper, and then worked the resulting negative-cast image with colored pencil. Ether resembles a constellation chart and a cyanotype photogram, articulating a possible shape of the cosmos, as well as our desire to record and order the world. The identity-exploring artistic practice of Marc Swanson (American, b. 1969) combines materials and narratives from the artist’s personal history into gorgeous, confessional yet enigmatic diorama-like constructions. Covering taxidermy deer heads with glittery rhinestones, for example, Swanson regularly meshes ritual crafts from his rural upbringing with emblems from his coming-of-age in the queer club scene, often uniting clashing symbols of masculinity and power in a single work. In the two cloth and chain works on view, Swanson reconfigures personal tokens into understated yet seductive memorials. In Untitled (Black Fabric with Chains) (2009), the artist rehangs a sun-bleached curtain from his studio window and embellishes it with dangling gold chains. Imprinted by the sun, the cloth carries a physical memory, a ghost-like mark of time past that Swanson touchingly celebrates with adorning jewelry. In the similarly melancholy Untitled (Wall-hanging Shirt and Chains) (2011), the artist drapes worn cotton t-shirts, which have been sewn together and covered with latex. Fringed with limp chains, the curving, pleated fabric arouses a baroque-like pathos. Finally, a new pyramidal, pyre-like assemblage of antlers encrusted with white rhinestones transforms a symbol of death into a dazzling monument to renewal. Stockholm-based Sigrid Sandström‘s (Swedish, b. 1970) paintings elicit encounters with landscape as well as painting itself, as an unsettled optical and physical site. Her early acrylic and oil works depict environments reminiscent of the glacial topography of her native Sweden, accented with geometric shapes and expressive paint handling that heighten the vertiginous and bleak emotional dynamics of her subject. Recently Sandström approaches her paintings as an exclusive painterly space with no outside referent. Layering streaked grey and black backgrounds with colored rectangles and diagonal lines in an indeterminate process, she offers the viewer another, direct engagement with the seemingly remote and devoid. Sandström’s newest paintings accelerate her exploration of articulating vacant and barren pictorial space with abstract form. In medium to small size canvases, bold, blank shapes create an uneasy, if not violent spatial interplay, simultaneously jutting and receding, as well as obscuring and cancelling out, delimiting and emptying out elements of each composition. Occasional transparent and opaque bars, resembling strips of the masking tape used to create the sharp edges of her shapes, provoke further feelings of visual cohesion, negation, and uncertainty.